Online learning tools are connecting Africa's students to massive open online courses. This is according to a recent report by Ambient Insights, which notes the partnerships are fast-tracking education improvement from primary school to university, potentially levelling the playing field for millions of students worldwide. Africa's e-learning market has doubled from 2011 to 2016, reaching $513 million, says Ambient Insights, adding that SA is Africa's largest e-learning market, followed by Angola, Nigeria and Tunisia. Meanwhile, Senegal, Kenya, Zambia and Zimbabwe are posting 25% annual e-learning market growth, the market research company says. In the face of electricity shortages and over-crowding, Ambient Insights says African public-private partnerships are integrating technology in education to enhance learning. Broadband supports tablets, laptops and online courses, to reach students with poor or no access to education, improve teacher training and lower costs, according to a recent report by Unesco. Industry experts say online learning tools can connect Africa's students to massive open online courses or platforms that provide free virtual tuition from some of the world's top universities. Mark West, a mobile learning expert at Unesco, says: "E-learning is a portal into educational opportunities that, frankly, hadn't existed before, and some of those opportunities - if you can afford the broadband connection and the hardware to use that connection - are free. For really self-motivated learners, it's remarkable." "Africa is one the world's most dynamic education markets. Public-private partnerships show best practices for using technology to reach marginalised students with technology that students use in their daily lives. Africa presents exciting business opportunities for education technology vendors and start-ups worldwide," says Trixie LohMirmand, senior vice-president at Dubai World Trade Centre. Moira de Roche, independent learning specialist and director of the Institute of IT Professionals SA, says "e-learning has come of age in SA". "It's now more about how to implement, rather than whether to implement. There is also more focus on measurement. Universities are seeing that in addition to traditional degrees - which are still largely classroom-based - they can develop diplomas that are delivered online to increase revenues and reach a far wider audience," says De Roche. She points out there are several benefits of e-learning, including: students can learn at their own pace, in their own time, and are easily able to redo a course for refresher or remedial training. With e-learning, she notes, a much wider audience can be reached and the learning is more suited to millennials, as they are not interested in reading long texts. "I am very pleased to see that education departments and universities are taking e-learning seriously at last. However, education and business have to see that e-learning is every bit as good as traditional methods - but is so much more scalable." In SA, e-learning is becoming an attractive option, especially with the recent violence seen at several universities across the country. Local university students have engaged in the #FeesMustFall protest movement that began in mid-October 2015 in response to an increase in fees at South African universities. This year, the students are protesting about the proposed fee increases for 2017 announced by higher education minister Blade Nzimande. The minister said fee increases would be determined by university councils, and recommended that they not go over 8%. The students have rejected this proposal, saying they want free education for all. Enrolment at universities is also a challenge in SA as more and more students seek tertiary education. Since 1994, the headcount enrolments at the country's universities have approximately doubled to almost one million students. This increase has usually resulted in chaotic scenes at varsities at the beginning of each academic year, with hordes of students looking to register. Tariq Fancy, founder and executive director of the Rumie Initiative, says African education projects are seeing the power of partnerships with local and international NGOs. 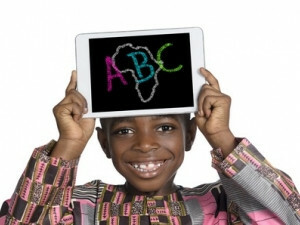 The Rumie Initiative, a Canada-based NGO, has produced the Rumie tablet that is in the hands of more than 3 000 children in Africa, including in SA, Benin, Egypt, Ethiopia, Gambia, Kenya, Liberia, Sierra Leone, Tanzania and Uganda. "Rumie saw an opportunity to give disadvantaged students access to the kind of free digital learning materials that had been available only to affluent schools in the past," says Fancy. "Tablets can be sourced and distributed cheaply, the cloud provides low costs for storage, and crowd-sourced content allows educators to provide students with the local resources that best meet their needs."